Fake money is a big problem in Peru — and Peru is a country of master fabricators when it comes to counterfeit cash. Counterfeit banknotes and coins are common, so you need to be on your guard when dealing with both Peruvian currency (the sol) and the US dollar. Try to get into the habit of always checking the money you receive, and use the following guidelines for identifying counterfeit money in Peru. Image of a genuine S/.10 banknote, front and back. Watermark – You can see the watermark when you hold the banknote up to a source of light. The image itself appears in light and dark shades created by density variations in the paper. Each sol note uses the face of its principal character as the watermark (for example, the face of Jorge Basadre Grohmann appears on the S/.100) with an object just behind it (for example, a book behind the head of Raúl Porras Barrenechea on the S/.20 note). Security thread – Each banknote has a security thread running from top to bottom, slightly offset from center. Along the length of the thread, you will see “Peru,” the denomination of the note, and the initials BCP. The S/.100 and S/.200 notes have holographic threads adorned with tiny symbols representing fish. Number alignment – Each note shows a partial image of its relative numerical denomination on front and back (known as the Registro Perfecto). When held up to the light, these two parts align perfectly to show the complete number. Latent image – On the front of each note is a colored box (near the bottom left-hand corner). Raise the note to your eye and tilt it horizontally; you should see the note’s value appear in the box. Micro impressions – On the front of each note (bottom left-hand corner) you will see the note’s denomination. The numbers are filled with micro impressions of the word “Peru” or the initials BCP (or a combination of both). Color-shifting ink – Beneath the national shield on the font of each note (right side) is the note’s denomination. This figure is printed in color-shifting ink. Rotate the note and you will see the color change, with variations of purple, gold and green. Fluorescent images — The notes contain various florescent images that can be seen under UV light. You can read more about the security details of each Peruvian banknote at the Banco Central de Reserva del Perú website (in Spanish, but with images). Police in Lima following a raid that obtained half a million soles in fake money. Touch – The 100% cotton paper used to make the sol has a distinctive texture and strength not generally found in fakes. Familiarizing yourself with the feel of the genuine article will help you identify a fake through touch. Genuine notes also use relief printing, so they should not be completely smooth. Run your finger along the “Banco Central de Reserva del Peru” print; you should feel a slightly raised pattern. Look – Look for the security features noted above. The watermark is one of the easiest things to check. It is located in the apparently blank part of each note; when held up to the light, you should see the image with a three-dimensional quality. The watermark (the famous figure’s face) may appear on a counterfeit, but it is unlikely to have the definition found on a real note. Turn – Raise the note to eye level and turn it on its axis. Pay attention to the color-shifting ink on the central number, which should alternate between green and purple when turned in the light. Note: the age of a Peruvian banknote plays a big part in its initial appearance. New notes may look suspiciously crisp and smooth, while the security features on ragged old notes may not be so evident. Bear this in mind when checking a note’s authenticity. Peruvian coins have not escaped the attention of counterfeiters, but most fake coins lack the detail found in the genuine article. There are a few key areas to look at when trying to determine a coin’s authenticity. 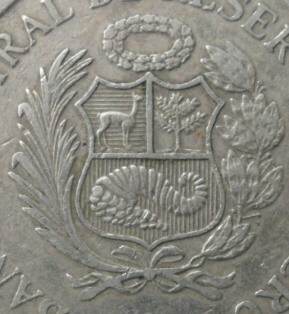 One side of each coin is stamped with the Peruvian national shield. Inside the top-left of the shield is a vicuña, and below it is a cornucopia with coins spilling from it. Look at the horizontal lines behind the vicuña and the vertical lines behind the cornucopia. They should be straight, evenly spaced and parallel. The coins spilling from the cornucopia should also be well defined. Small deformities will occur through wear and tear and minor minting imperfections, but any major defect would signal a fake (the image to the right is a genuine one sol coin). Any text, logos or numbers on the coin should also be clear, precise and free from defects. For more information with images, have a look at the Policia Naconal de Peru’s Techniques to Detect Authentic and Counterfeit Coins (Spanish only). You guessed it… fake dollars are also a problem in Peru, as this report from VICE News clearly reveals. That obviously points to some huge counterfeiting operations in Peru, and a flood of fake dollars within the country itself. For more information about identifying fake US dollars, visit the US Currency Education Program website.